Summer knitting here I come! I knit all year through. In winter I often, but not always, knit with wool. In summer I often, but not always, knit with cotton. Although I love knitting, I don't knit for pleasure. 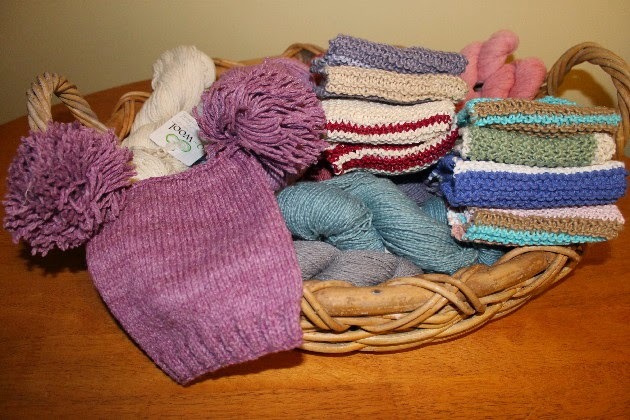 For me, knitting is part of my system of home production, providing clothing, gifts and everyday items to use in my home. 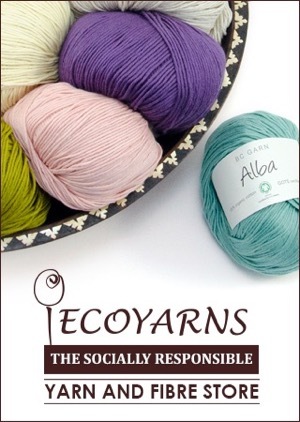 I am fortunate to have Vivian at EcoYarns as a sponsor and I use various cottons, wools and alpaca from EcoYarns for my projects. 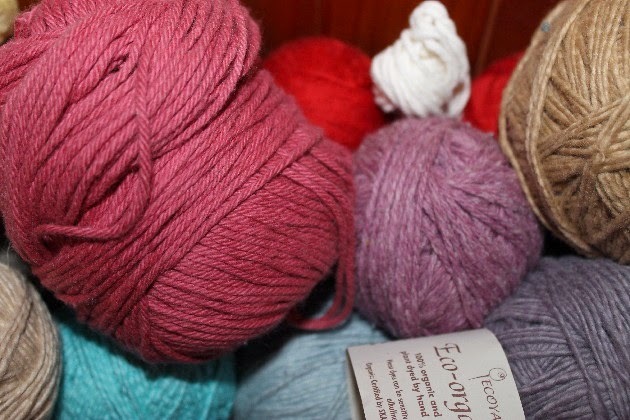 My favourite yarn to knit with, not just now but in my knitting life, is Vivian's 8 ply organic cotton. 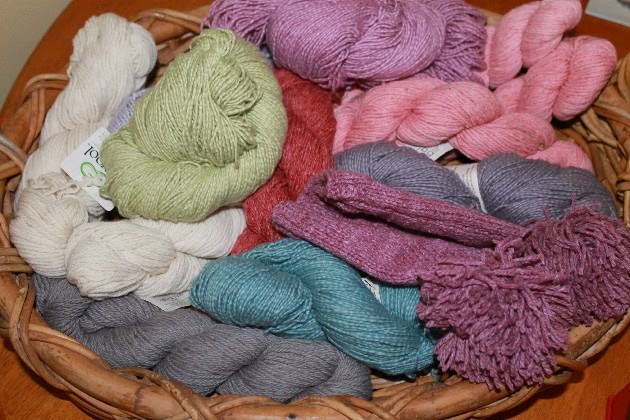 Not only is it a real pleasure to knit with, the cotton comes in a range of beautiful natural colours and it has a great story attached to it. I love the names of the colours too - patience, temperance, courtesy, pride, honesty etc. 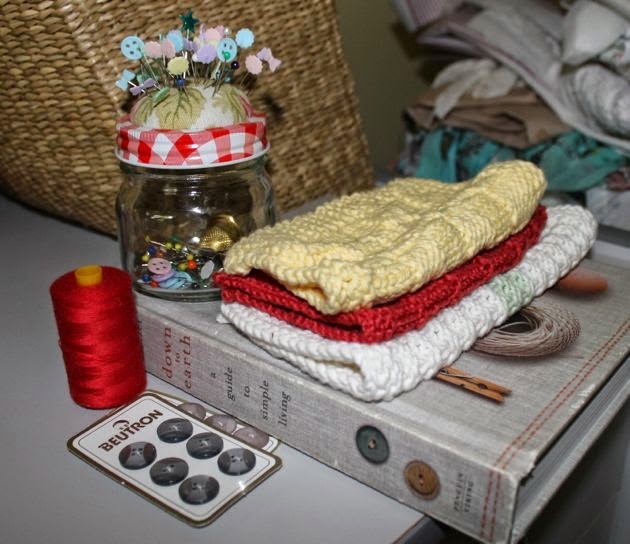 These are my jars of bits and pieces for knitting and sewing. They're filled with small scissors, pins, stitch holders, place makers and darning needles. I love being surrounded by good quality yarn. 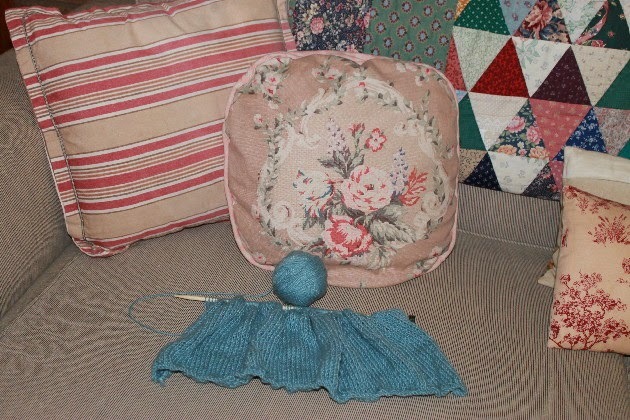 Soon I'll be doing my summer knitting. The point in the year that marks the start of summer for me is when the first cricket test match starts. Usually that is late November or early December. This year the first ball is bowled on 4 December and on that day I will be ready with my knitting basket on one side and a cold drink on the other. I know another lady, Sue in Perth, who does the same thing. : - ) I sit there, take it all in and know that for me, the hot months ahead will be made better by clicking those needles together and looping yarn around them. These test matches start at 11am so it gives me ample time to organise my chores or water the garden before the time comes to take my seat and pick up my needles. It's a nice easy start to summer for me. November and December is a good time to get last minute Christmas gifts organised and finished, then I go on to new or larger projects. 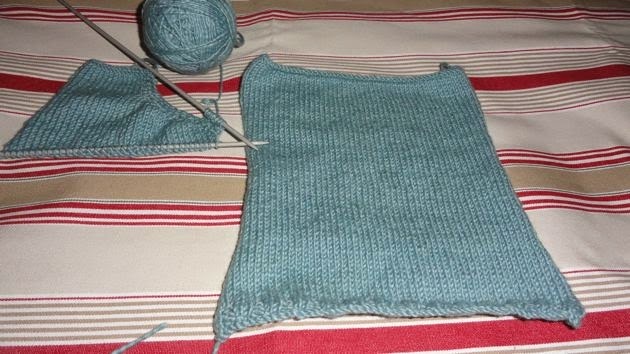 At the moment I'm knitting something for myself - a blue organic cotton sleeveless vest. I think it will be good to wear on those very hot days when we have the air conditioner going and I need something light on my back. I've just gone through a period of knitting cotton dish cloths. I did some as samples for my library talks and some as gifts. Over summer I'll knit another batch of about ten to have on hand here. Have a look at this delightful English knitting group. Knitting brings all sorts of people together through their love of knitting. If you belong to a knitting group, I'd love to hear about it. And this is about how knitting became popular again, and why. I'm really please newspapers and magazines are featuring knitting and knitters again because it brings more people to the craft and for those who rarely make anything, that's very enriching. 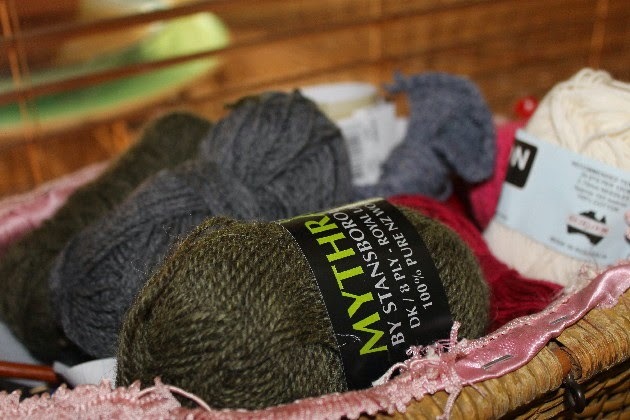 What inspires you to knit? 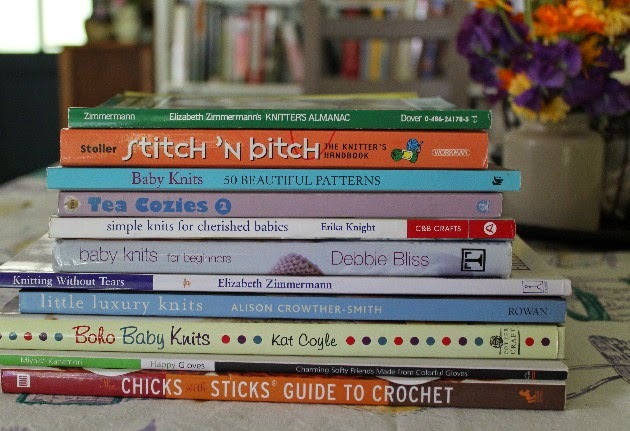 I have several knitting books and usually go through them when I'm looking for a project, but I also browse Pinterest, Ravelry and Knitty for ideas as well. It doesn't matter how you're inspired to knit but it matters that you are. I can't imagine a world with no hand knits and no knitters. Happy knitting everyone! 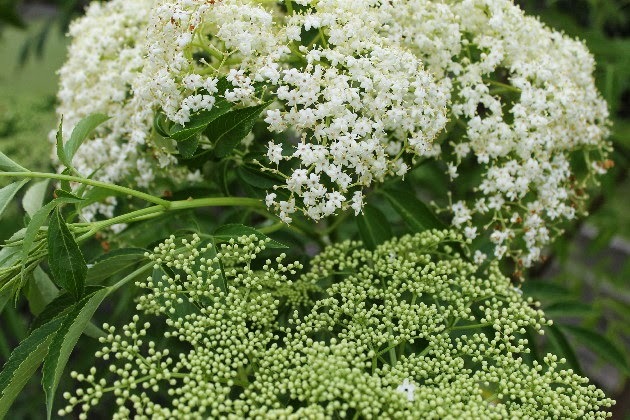 Elder flowers - open at the top and still closed at the bottom. Often, when new gardeners get through the first years of vegetable gardening, they think about adding fruit to their backyard crops. It's an excellent idea and fruit is quite easy to grow, as long as you're in an area with no animals or insects to spoil your efforts. If you are adding fruit, start off with some of the easy things, depending on your climate of course, like lemons, mandarins, oranges, passionfruit, strawberries, blueberries or elderberries. My selections for the two easiest fruits are strawberries and elderberries. Strawberries can be grown in pots or in the ground and a few weeks after planting your first strawberry runners, you'll have delicious berries. 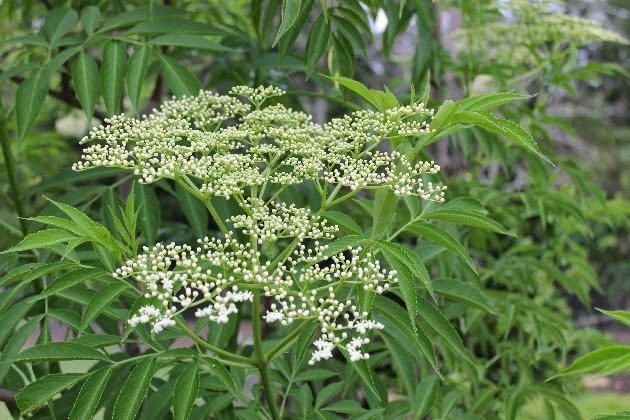 Elderberry is a tree but it grows fast and doesn't have too many problems. Using either the berries or the flowers you can make a fermented, champagne-style white wine, a red wine, non-alcholic elderberry cordial, elderberry jelly, puddings, cakes, immune booster against flu and elder tea. Woolworths sell elderflower cordial for eight dollars a bottle but you could make your own for about 50 cents. Elderberries and flowers are highly nutritious and many people take elder drinks for their healing properties. However, elderberries should not be eaten raw and you should use only the flowers and the berries, no stems, leaves or bark. They can make some people sick. 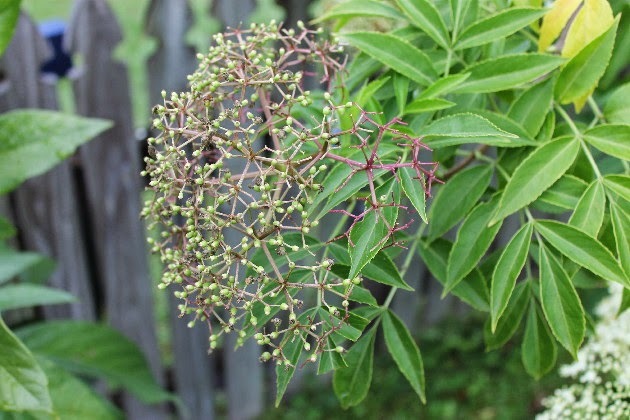 Elderberries are native to eastern North America and many parts of Europe. They are two separate species but they're so similar that the North American variety is thought to be a sub-species of the European one. Both species can be used in all the links in this post. There is a warning though. Given the right conditions, elder will send out suckers and you may have more plants than you know what to do with. Our own experience with it has been that it needs quite a bit of water and if it gets it, suckers will apprear. You have to be brutal. We just pull them out. It's an easy enough exercise and so far we've never had a problem with our main tree or any of the suckers. I first came across elder when I found a small plant at our local organic food co-op. I'd heard about elder and knew the late John Seymour was a great fan of them, but I'd never seen it in Australia before. 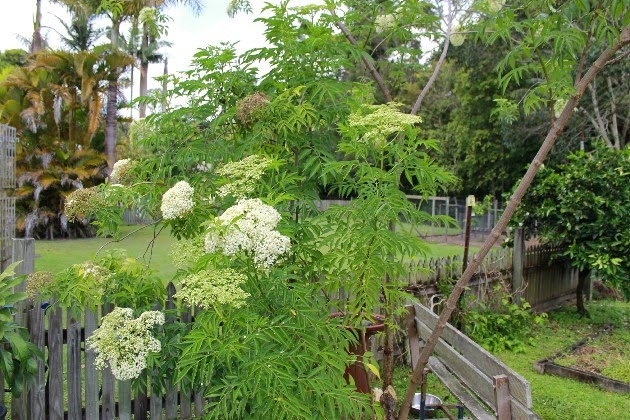 I bought that little elder seedling, planted it and within two years it provided enough shade for our garden bench. Hanno and I still sit in the shade of the elder tree and for that reason alone it has been worth the price and the effort to grow and water it. Elders respond well to a high nitrogen feed a few times a year; comfrey tea is ideal. And as it grows, clip it back to keep it to a size that you can manage. It responds very well to pruning in early spring and will send out a lot of new growth, particularly if you give it a good nitrogen feed at the same time. 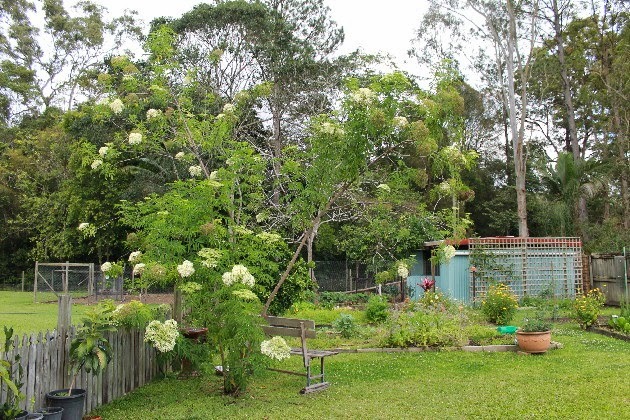 Our elder tree is one of my favourite things in our back yard. I try to get others to grow it, and always have a couple of suckers here potted up and ready to give away. I think only my sister and one other person have taken up my offering, but I still try to spread the good news about that tree. It's spring here so our elder is starting to flower. If history is any guide, the flowers will develop small berries and then they'll drop off. That's the down side of a warmer climate with elderberries - they like the cold and I'm guessing anywhere north of Brisbane they'll develop the flowers but not the berries. We have had a few winter berries but not enough to do anything with. If you're in a colder climate though, you'll be able to use the flowers and the berries. 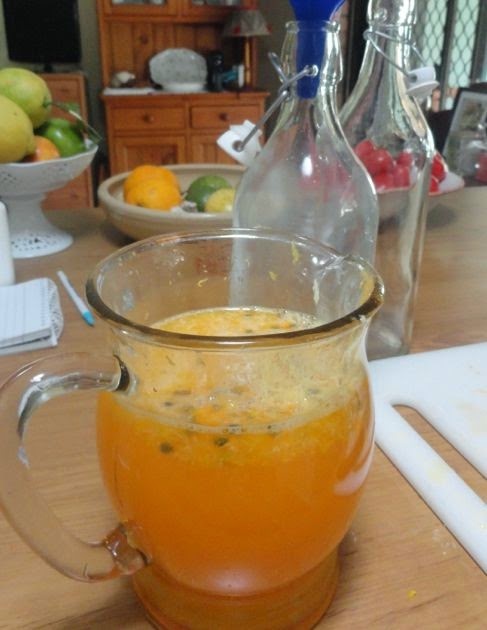 So far I've made elder flower cordial - and that was truly a delight in that it didn't taste of fruit and sugar, as most cordials do, it tasted more of flowery honey instead. Using that cordial, I made elder ice cream. That too was delicious. 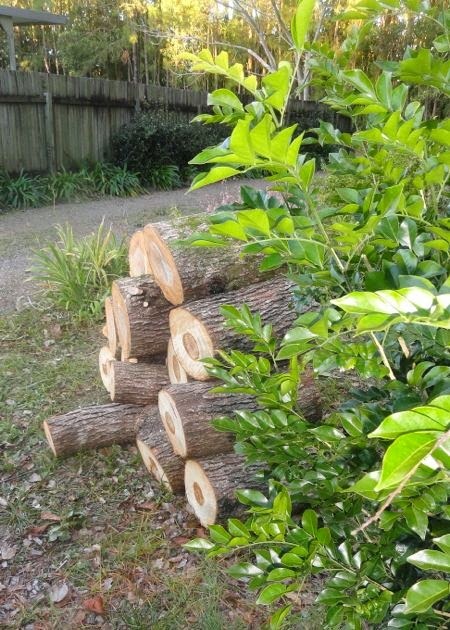 Overall, an elder tree will stand you in good stead as a shade tree or as a productive part of your garden. Christmas champagne made using elder flowers is a seasonal delight. I've included the River Cottage video link below. But champagne is just the start. It's worth experimenting with jams and relishes too and if you produce a basket of berries, try making wine. 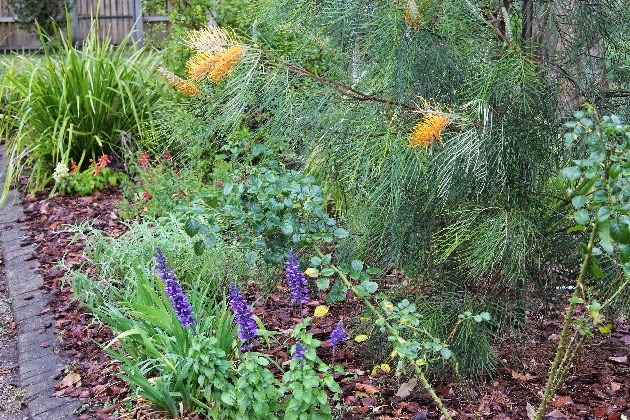 It's an easy to grow tree and even if you only use it for shade, it's worth the effort. Do you have elders growing in your garden? 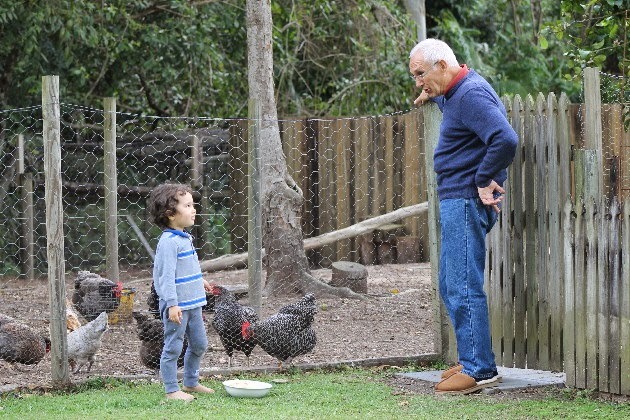 Feeding the chickens, learning through doing. 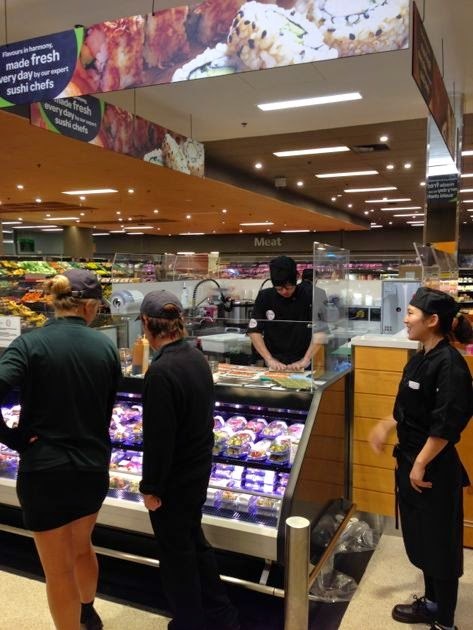 It's been a big week here for all of us with Sunny's Sushi Isu opening, a visit from Shane, Sarndra and Alex, the early mornings trips to pick up Jamie and looking after him here. It takes a lot of energy but we love it and wouldn't have it any other way. In fact, I didn't get the chance to do my post at the usual time today because at 3.45am I drove over to Sunny's to pick up Jamie. Now he's outside with opa, they're gardening and I can hear them laughing, so all is right in my world. I hope it is in yours too. Thanks for your visits and comments this week. Down below I've included Roman and Jana's Spurtopia workshops and open days. 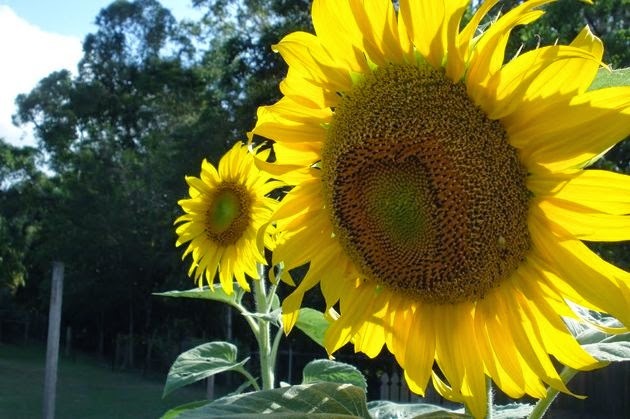 You may have seen them on Gardening Australia. These workshops are at their home and they'll be great for you if you want to learn or be inspired. Donations are welcome. Also below are details of the Brisbane Craft and Quilt Fair. 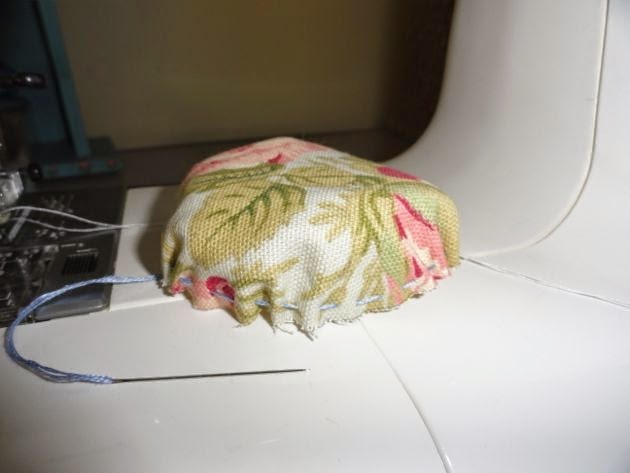 I love this little handmade sewing kit. It would make a wonderful gift for a sewing friend.  Learn and make your own self-watering planter box.  Learn about our way of living a healthy lifestyle and what you can do to avoid chemicals. Includes household chemical free recipes.  Learn about garden design, how to make organic soil and fertilizers, pest control and lots more.  Information and tips to get you started with beekeeping. 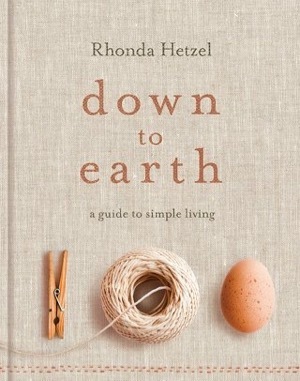  Ideas, inventions and tips for sustainable living - includes garden tour and sampling of homemade food items.  Learn, share, discuss how to bring up kids in the most natural and chemical-free way.  Learn how to make a solar cooker and ideas for building a solar hot water system – includes cooking tips. 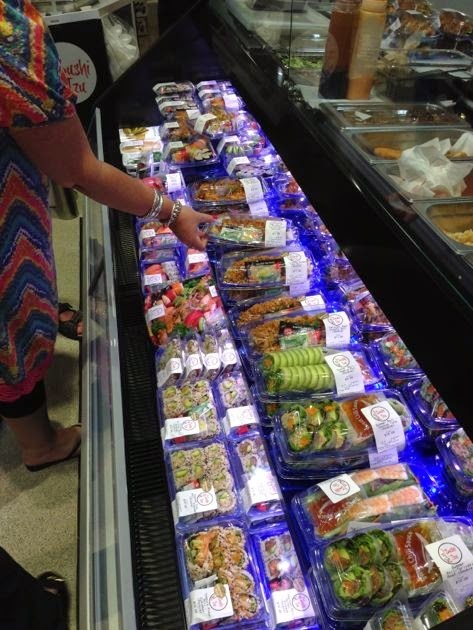 Sunny opened her sushi bar (Sushi Isu) in the Caloundra Woolworths yesterday. Hanno took Jamie to day care and dropped in to see her afterwards. He was really pleased to see the excellent display and a lot of people looking and buying. That is Sunny on the right. I think Sunny will do very well in her shop. She is such a hard worker. This is the first time she's done anything like this because she's always been employed as a chef in the past. I am so proud of her. She's been working non-stop these past two weeks and this week she's been getting up early and coming home late to make sure everything was perfect for the opening. She and Jamie stayed here overnight and yesterday morning she left here at 3.45am, after she'd made sure she had everything prepared for Jamie, including making his snacks and lunch for day care and had all his clothes and nap bag ready. Kerry is still working hard in his job. He'll be home on Tuesday and then has a six week holiday so he can help Sunny during this very busy time. 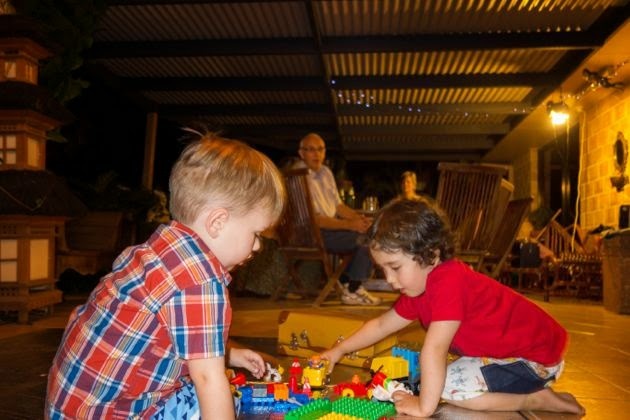 Our lives have been revolving tightly around our extended family recently. During a visit from Shane, Sarndra and Alex, we looked after Alex overnight while his mum and dad had a rare night out together at an engagement party in the big smoke. It was the ideal time to be looking after Jamie as well, so he was dropped off during the day while Sunny prepared her new sushi bar for opening today. Looking after two three year olds certainly has its challenges but oh, the laughs and smiles were non-stop. To hear my own grandsons talking to each other for the first time was priceless and unforgettable. They played so well together and even after hours of playtime, shared meals and trips in the car, they were still firm friends with no fighting, even over the small number of toys here. They really like each other! 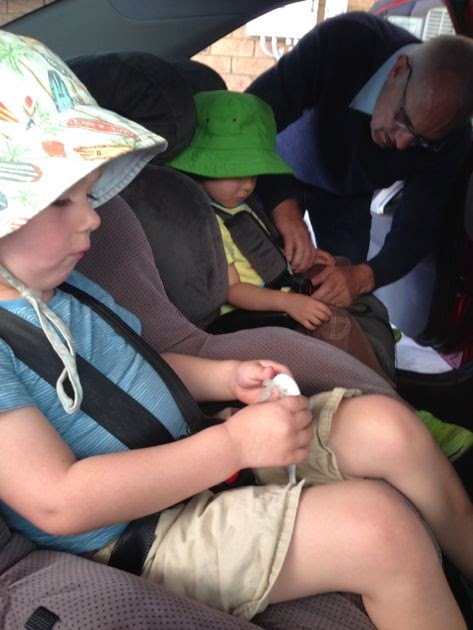 All secure in their safety seats on the way to the shops. This week we're dropping off and picking up Jamie from day care. It takes me back to my youth when life was wound tightly around my sons' wants and needs. It gives me a reason to regret the passage of time and to celebrate it too. When I was younger, with my own small boys to care for, I could never be sure what the future would bring. 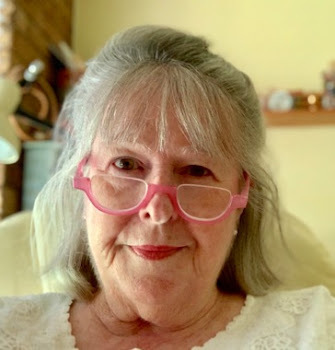 I certainly never thought too much about the gift of grandparenthood, but I'm pleased to be here now, just as happy as I was when I was a younger woman, and maybe more so. And who can tell what the future will bring. The only certainty is that there will be change and, in time, babies will replace grandparents. Last Friday night at Sunny and Kerry's home. Here at home, we have these little pockets close to silence in between periods when we're needed as care givers, then it's activity and noise while we do that caring, and back to silence and gentle slowness again. I can't describe the feeling I get knowing we're a necessary part of this family. The richness of our days is far beyond what I expected later in life. But here we are, still looking after boys, peeling fruit for little hands, reading story books aloud and picking up toys, again. I'm not sure how I'd go being a full time carer now. These brief periods are enough. They're precious to me but they're exhausting. Still, they're part of our changing lives and I'm grateful we have the opportunity to be active grandparents and part of this beautiful and ever-evolving family of ours. Family life is about as complex as it gets and it doesn't suit everyone. It has its challenges as well as its rewards. How do you fit into your extended family? Over the past year or so I've been heartened by the emergence of a new kind of magazine. I'm no longer the "expert" on magazines I once was because I rarely buy them now, but these new kids on the block tend to be non-mainstream, presenting either specialist subjects or with a focus on delivering good quality information in a creative and easy to read format. The icing on the cake is there is no blitzkrieg of advertising. The advertising it contains is relevant and often from shops or companies you might never have heard of before. It's a good way to find out about products that aren't easily found, but you want to know about. About a year ago, much later than many of you, I discovered Frankie - loved it and wrote about it. Another good example of this style of magazine is Slow. 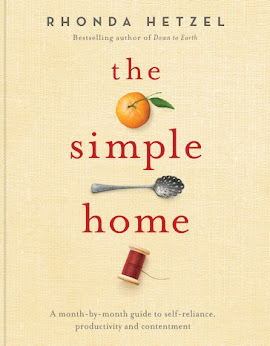 It's full of information that should appeal to those of us living a slower and more simple life. 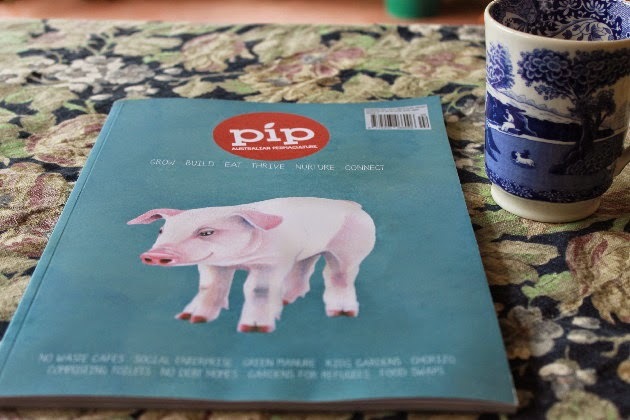 Now, enter PIP magazine. 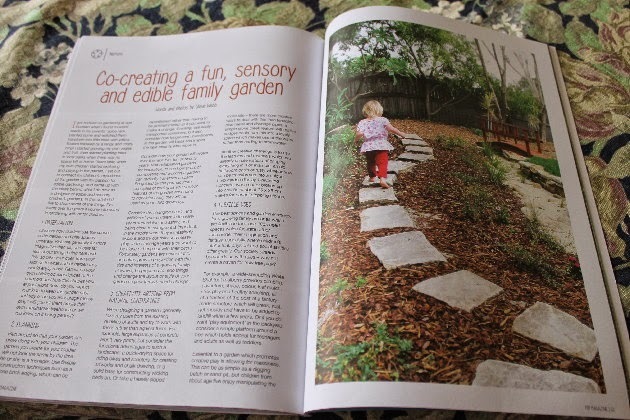 It's an Australian magazine about permaculture and living a softer, quieter life. 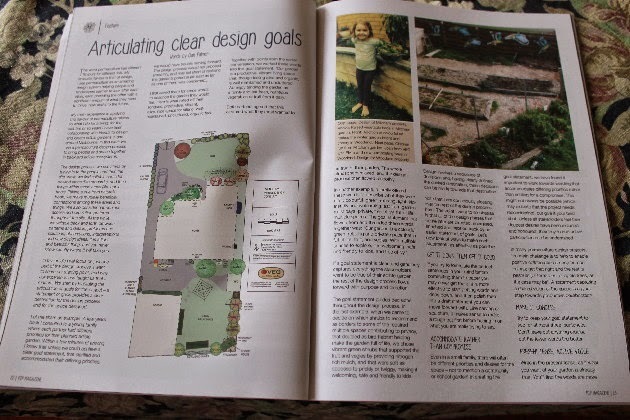 It features regular permaculture articles about design, meaningful change and planning, while the bulk of the magazine features the sections Grow, Build, Eat, Thrive, Nurture and Connect. Those sections in this edition contain a wealth of information about lifestyle, sustainable farming, community development, green manures, growing your own meat and no debt housing. 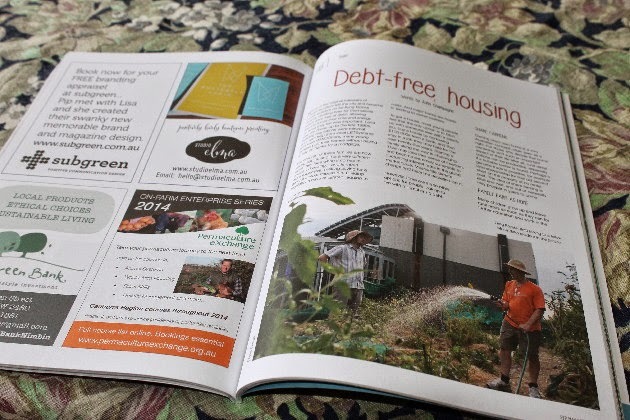 I was delighted to see articles from two women I know from afar: Robyn Clayfield and Morag Gamble are both significant figures in Australia's permaculture community. 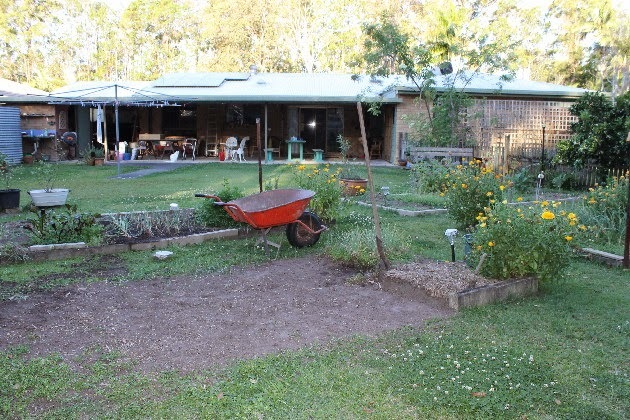 Robyn writes about the ethics and heart of social enterprise and Morag profiles her own home at Crystal Waters and the process of creating that home and garden. She and her partner Evan created their home, with no mortgage, over a period of about ten years. It's an inspiring read. There is also an article about parenting the permaculture way that takes the principles of permaculture and applies them to parenting. It's similar to the post I wrote a few months ago when I applied those same principles to house work. We've been told for a long time now that print publishing is on its death bed and soon paper magazines and newspapers will be a thing of the past. PIP is not your run-of-the-mill magazine. It's thoughtful, creative and interesting and the ideals it hold close are delivered intelligently and with passion. If print magazines do survive, I think it will be publications like PIP that will breathe new life into the tired old format. Ask for it at your local newsagent or check out their website here. I think you'll like it. I have not been paid for this post. There are so many different mops around now. Last time I looked, there were cotton mops, sponge mops, rayon mops, microfibre mops, well, let's just say there are a lot to choose from. 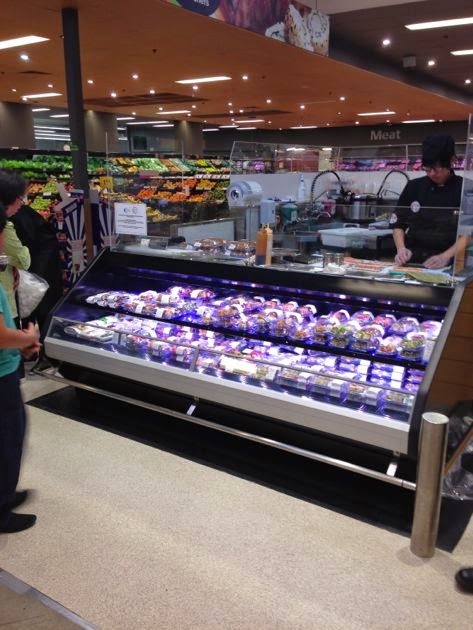 Sometimes giving people a big selection is confusing and they don't know what to buy. Recently I had an email asking about mops and what mop was suitable for a tiled floor. It reminded me of another email I received a few months ago asking a similar question about the difference between cotton mops and sponge mops. We have tiled and floating wood floors here. Over the years I've tried sponge and micro-fibre mops but always come back to my cotton mop. They glide effortlessly across any floor type, they're easy to squeeze the water from, easy to clean and they dry in the sun - which is another way to disinfect a clean mop. I want my mop to clean my floors properly, to be locally made and environmentally friendly. A side consideration is the cost of the mop. When buying a mop, always buy the best quality you can afford, it will last longer. Remember, the best quality doesn't mean the most expensive, although it might be. The best quality cotton mop will be made using natural cotton and it will probably have a replaceable mop head. These heads can be detached for washing in the washing machine if they're really dirty. When the mop head is too stringy, after years of wear, you just replace the head, not the handle. I've had my mop for about ten years and it's still going strong. You should always use a clean mop. Using a dirty mop will just spread the dirt back onto the floor. You must also sweep or vacuum the floor before mopping. If my floors are fairly clean, I just use a half cup of white vinegar in a bucket of hot water and that cleans the floors very well. If they're dirty, dusty or greasy, I use the vinegar and add a tablespoon of liquid soap or a quarter cup of laundry liquid. Again, this does the job. I don't need to buy a specific floor cleaner, I don't need it for the kind of floors we have here. So there you have it. Start with a swept or vacuumed floor. Cotton mop, vinegar and a bit of soap or laundry liquid for a heavier job. You'll get a clean floor with little environmental impact and for the most cost effective price. Sure you can go with the steam cleaners, microfibres and man-made cleaning solutions but I doubt they'll do a better job than this low tech option. Remember, it's not just your food that you'll try to source locally. All your product choices should also be environmentally acceptable and frugal. When you finish mopping the floor, pour out the dirty water in the bucket, fill it with clean water and agitate the mop around in the water. If it's particularly dirty, you may have to wash the cotton head with soap and rinse again, or you can soak it overnight in a solution of oxy-bleach (Napisan) made up according to the instruction on the container. If it needs a thorough clean, detach the mop head and put it through a fast cycle in the washing machine. When you clean the mop head, take it outside and dry it in the sun. I usually have mine over the washing line or upside down, against the fence. 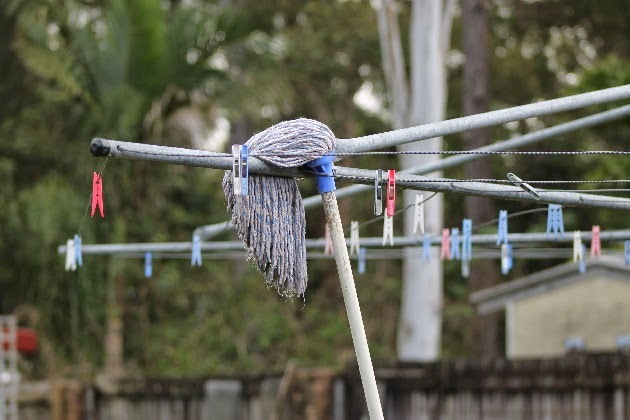 When the mop is dry, take it inside again and hang it up so the cotton remains dry and clean until you need to use it again. Cleaning the floor doesn't have to cost a lot of money, despite what advertisements tells you. A simple cotton mop with vinegar or soap will do the job nicely. As long as you start with a clean mop, you should get a clean floor every time. I'd be interested in reading some of your green cleaning methods for your floors, particularly if you have an old or new wood floor or a vinyl floor. What mops are you using and how do you clean them? It's been a busy but steady week here - nothing we couldn't handle. Now we're looking forward to our family get together later today. Shane, Sarndra and Alex will be here this afternoon, then we'll all head over to Sunny's. Over the weekend I'll be reading and writing. I bought three new books, two print books and Home Grown as an ebook and I'm looking forward to diving into them. I hope your week was productive and enjoyable. If not, it's nearly the weekend so I hope you get to relax and enjoy yourself then. It's not too long to go. Thanks for your visits and comments during the week. It makes me want to keep blogging when I know you're out there. My family and home are everything to me. My family define who I am as a wife, mother, sister, grandmother, mother-in-law, step-mother and aunty. None of us has just one role to play and often it requires flexibility and grace to navigate these waters with any sort of confidence and direction. Having a stable home life can make for smooth sailing, but it's not a certainty. Anything can happen at any time. But I always believe that if the home is secure and warm, where all the family members feel comfortable, they know there is always a safe haven for them, not only from the harshness of the outside world but also from the judgements that seem to come uncalled in these modern times. There is never one way to be a family. There is no one size fits all philosophy for how a family should work. Over the years there will be turbulent periods and times of peace and calm. You have to be ready for it all. 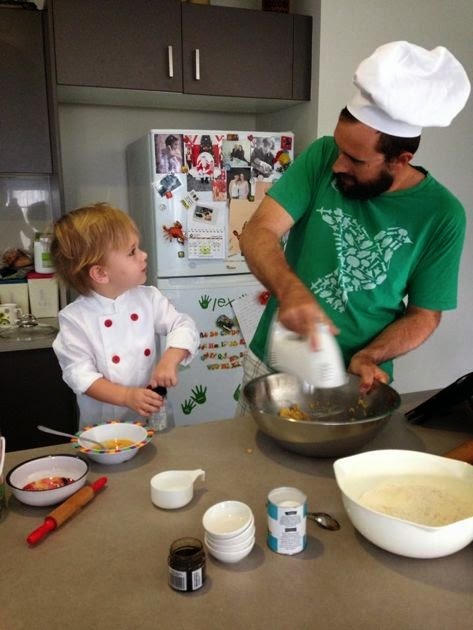 My son Shane, teaching his son Alex how to make a cake. My way of dealing with the complexities of family life is to try to be the best role model I can be. I try to accept people as they are, and the expectations I have tend to be focused on my own behaviour rather than on those around me. I do expect my family to live according to our collective values but I also take into account the changing circumstances that sometimes don't allow that to happen. And I'm acutely aware that as our family ages, some of the values that Hanno and I hold close will change and will be replaced by those of those coming after us. All those values are influenced by the times we live in, the influence of our extended families and by the thoughts and hopes of our younger generation. 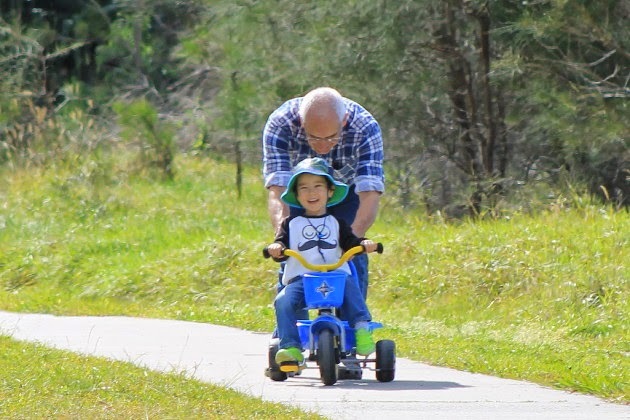 By the time we reach the lofty heights of grandparenthood, we have to let go and hope that all that has been taught is inherent, and we watch from the sidelines to see how it all plays out. Always without judgement and often with pride. I think we are a strong family and much of that comes from our family culture of support and encouragement. We are not perfect and not trying to be but we like and respect each other, we spend time together and you can see the ties that bind us are stable and secure. 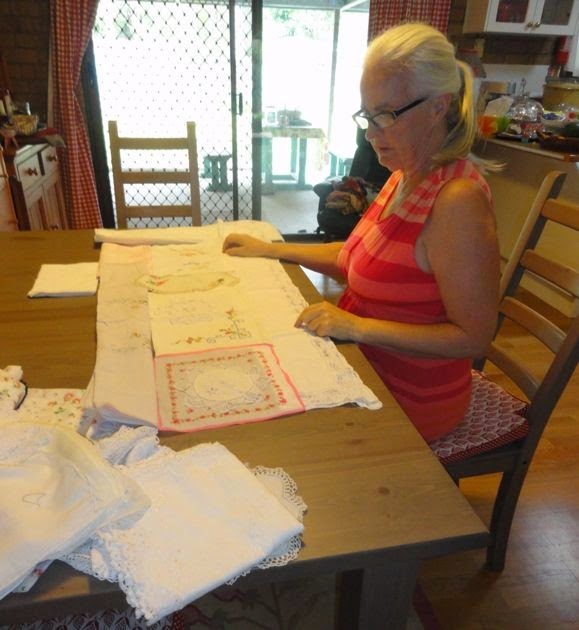 My sister Tricia, planning her sewing at our kitchen table. We have another family function coming up this week and there will be ten of us there. Sunny called us together this time because next week she'll start her sushi business and she wants us to get together before that happens. We also have three birthdays to celebrate - Hanno will be 74 on Friday, Sarndra's birthday is a few days after that, and Sunny's a few days after that. This will be the only time we can get together, so we'll take the opportunity to celebrate all the birthdays as well as our 35th wedding anniversary, which is on 28 September. We don't need separate occasions to celebrate, this one will do us just fine. The important thing is to be there with each other, to see each other face to face and not with a screen between us. Touching, hugging, holding the kids and talking to each other means a lot. Families rarely survive without that. I wear an apron almost every day. I have about 10 of them in the cupboard, waiting, but if the truth is told, I wear about five favourites and the rest sit in there. Waiting in vain. Aprons come easy to me. I grew up in a time when they were commonplace and I don't remember many women who didn't wear an apron when they worked in their homes. Wind the clock forward 20 years to the early 1970s, and there I was in an apron again, as a student nurse in one of Sydney's largest hospitals. Those uniforms were a nightmare to care for so it was lucky we had our laundry done for us. I doubt I could have made starch thick enough to make my aprons stand up alone, but that is what they did. Those uniforms were meant to keep us clean and more than that, to make us look clean and starched and proper. I was proud to wear that uniform and all those that came after it, but that first starched nurse's apron convinced me for a lifetime that aprons were my friend. I have a photo here somewhere of me in 1970 wearing my nurses uniform, with that stiff apron and collar. I'll find it one day and show it to you. 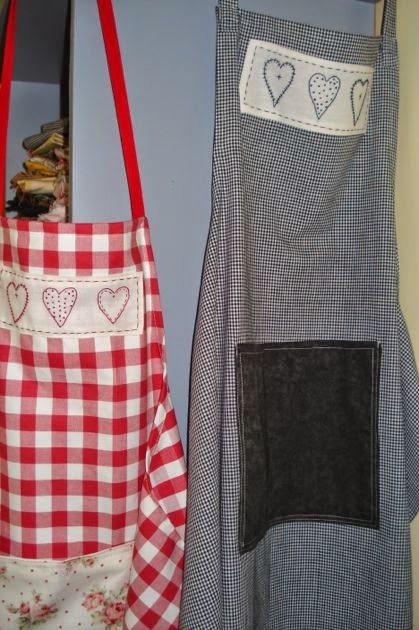 The photos above are just some of the many aprons I've made over the years. The one at the top was to help with local fundraising, these two check aprons were for apron swaps we had here at the blog. I think aprons fell out of favour for many reasons. One was that our dresses weren't as precious when our mothers stopped making them and we bought them instead. And I guess those new dresses had to be seen, another reason to keep the apron in the cupboard. 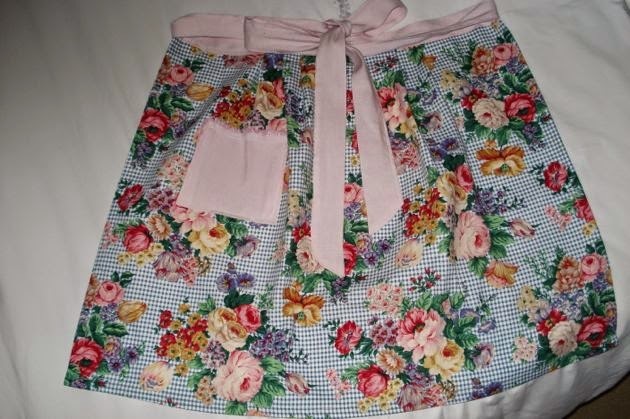 But lately I've been thinking about aprons, reading a lot about them and looking at many, many photos of aprons. I guess much of that is nostalgia creeping in but there is also a practical reason - I read on the forum about turmeric stains on a favourite cardigan. I know too that some of you are still cleaning a few odds and ends with chlorine bleach and that can spell disaster when it comes in contact with any sort of clothing. It will bleach the colour right out, before you have the chance to try to save it with a quick rinse. Enter, the apron. It provides a barrier between clothing and stains. They also help carry eggs from the nest to the kitchen, a camera can sit in the pocket during the day incase a photo needs to be taken and how many times have I wiped wet hands on my apron. 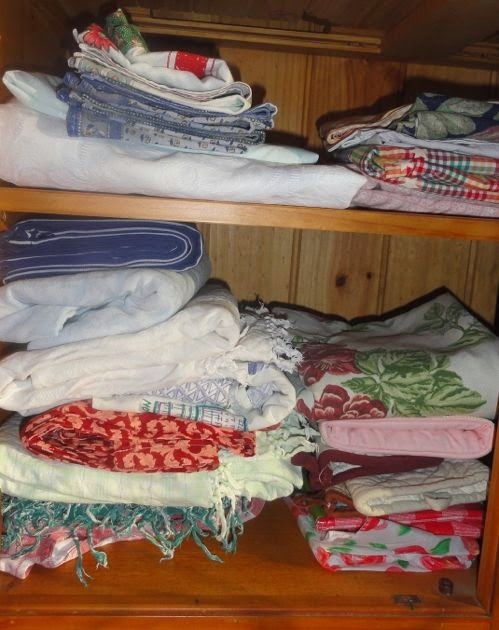 I keep my aprons in the linen press. That's them on the left. I didn't realise until I saw this photo how untidy they look. 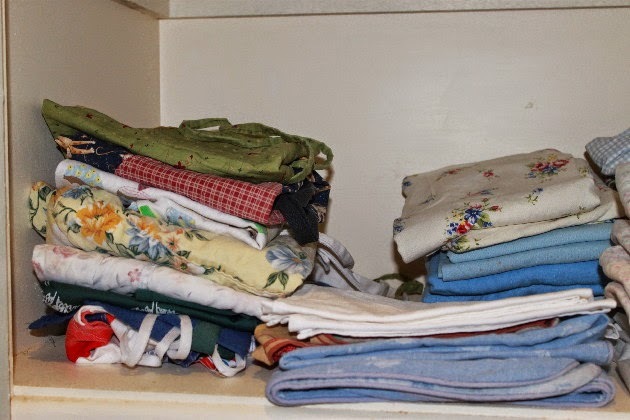 If I could encourage you to try two things that would help you in your home, I would choose wearing an apron when you start your house work and making your bed every morning. Both of them have more than one function. Wearing an apron will protect your clothes from the potential stains of cooking and cleaning but it also brings with the wearing of it a feeling of being in charge of your home. Making your bed will give you a clean and fresh place to sleep every night and once it's done, you have a starting point to your day. Some of you will be thinking that aprons symbolise a certain time in our history, and maybe that memory is a negative one. But I think that aprons have served us well in the past and can again now. To me it's just common sense and practical but there is also a feeling of pride when I put on my apron. It signifies that I'll be cleaning or cooking in my home and that I've taken the right steps to equip myself for the work ahead. I think works defines us - both paid work and the work we choose to do in our homes. And as a working class woman, I guess I could call my apron my badge and a symbol of the work I do here in my home. Do you wear an apron? This is our garden yesterday afternoon. Those of you who have been reading here for a few years will know that Hanno starts our new year garden off in early March. We can plant and grow all year if we wish to, and that is what we did for a number of years, but we found the humidity, heat and bugs of summer made it a very difficult and time consuming task. We then planted in early March, grew all through autumn, winter and spring, then stopped planting in late November. 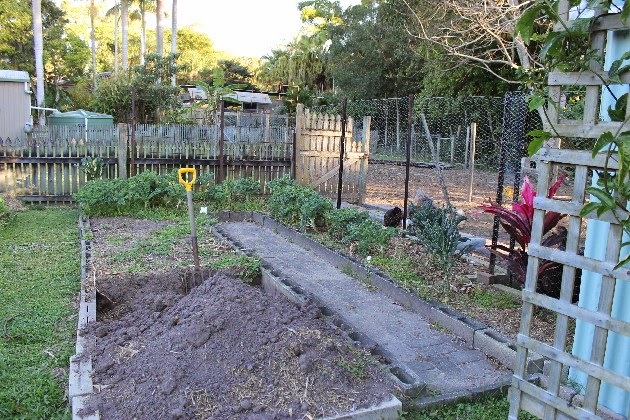 Over summer we continued to harvest tomatoes, capsicums, herbs, chard, cucumbers and beetroot but by late January it was all over and we left the garden to rest until March. That has worked very well for us until now. This year, production has stopped mid-season and changes are being made. We're growing older. We have to think of new ways to keep gardening but without the tiring jobs that make it more of a chore than it should be. Hanno is now harvesting our last crop of potatoes. They're Dutch Creams, a delicious waxy potato that holds its shape in salads, but is still very good mashed. These will be the last potatoes we grow. This year will be the last year too for cabbages, cauliflowers, broccoli, onions and turnips. There will be no more plantings of zucchinis, carrots, spinach or corn. From now on, we'll be concentrating on the fruits and vegetables we eat a lot of - tomatoes, lettuce, radishes, cucumber, beetroot, chilli, capsicums, chard, kale, beans and herbs. We'll continue growing fruit because it's easier to grow than vegetables - generally there are no repeat plantings, it's just fertilising, pruning, watering and harvesting. 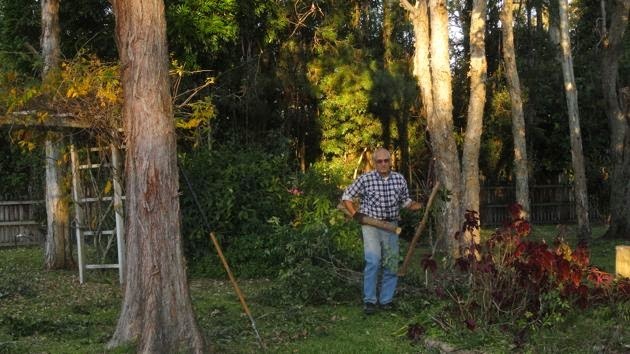 Simplifying in this way will be easier for a gardener with recurrent arthritis in his ankles and feet. We'll produce less overall but more of what we eat regularly, and we'll keep gardening. The garden bed above is almost gone. This is where we'll put our table and chairs. These two beds will stay. To facilitate this change Hanno is removing a couple of our garden beds. We'll keep a bed for salad greens, Asian greens and kale, we'll have a combined flower bed with the flowering vegies, such as tomatoes and cucumbers. 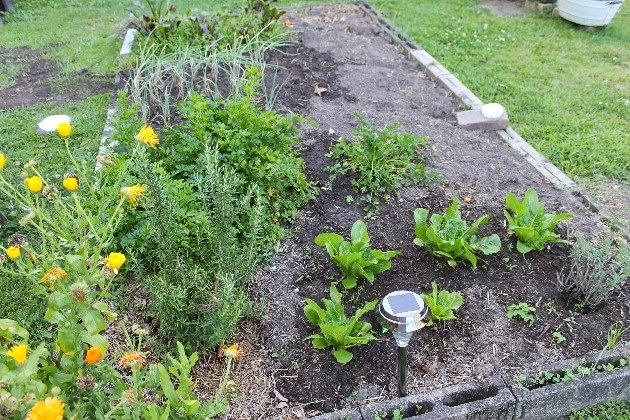 The herbs and other vegetables will be dotted around the remaining beds. Many people have suggested to us that we should have raised beds. We are garden soil people, we want to grow our food in active soil that is alive with microbes and minerals. The minerals are deep in the soil so we prefer traditional organic methods. So where garden beds once produced their crops, we'll have a table and some seating right in the middle of the garden. We'll be able to sit out there, under an umbrella, and listen to the bees and birds while we drink tea and talk. There is some sadness in this decision. Not only because we won't have those fresh vegetables straight from the garden but there is the loss of something that's been part of our lives for a long time. But we'll still have our summer vegetables, herbs, flowers and fruit, and that will no doubt keep our green fingers moving and satisfy this insatiable urge to grow food and watch it grow to lush, ripe maturity. This will be the flower and flowering vegetables bed. 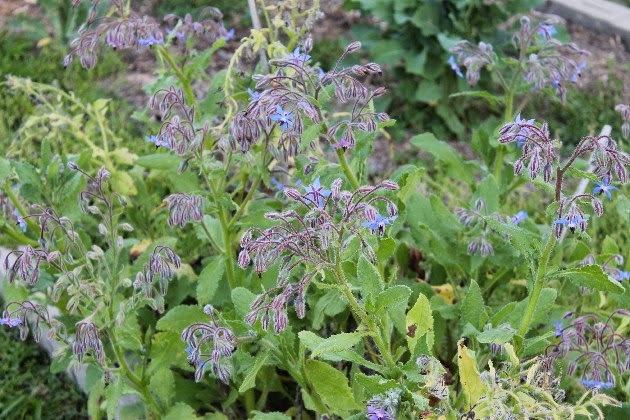 We'll cut this borage back and transplant it. I see this as a sensible compromise. We will still be growing some food but the pressure is off to be prolific. We'll only plant what we know we can handle. 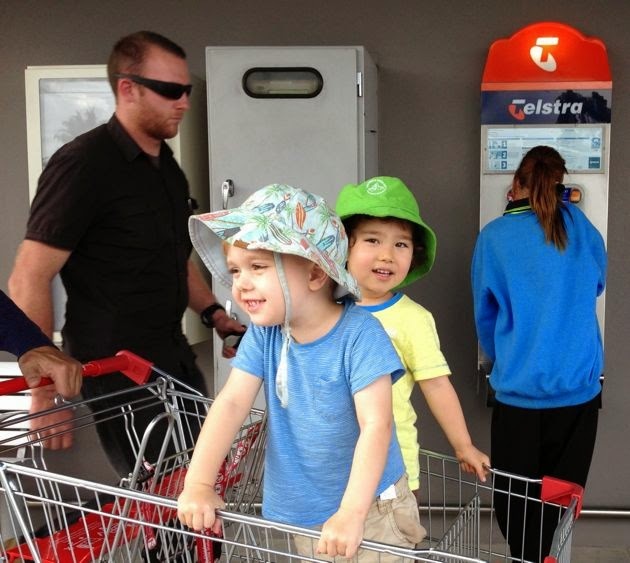 We'll shop at a local farmers' market for the rest of our fresh food - thereby supporting the locals. 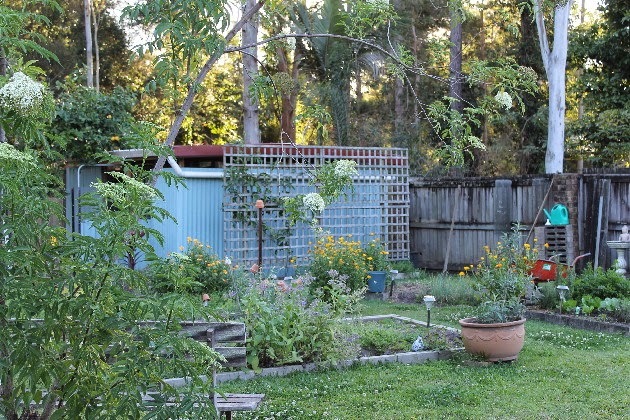 But we'll still have that connection with our backyard as much as we ever did but it will be a relaxed and simple connection rather than a more complex and active one. As usual, I'm looking forward to the weekend. 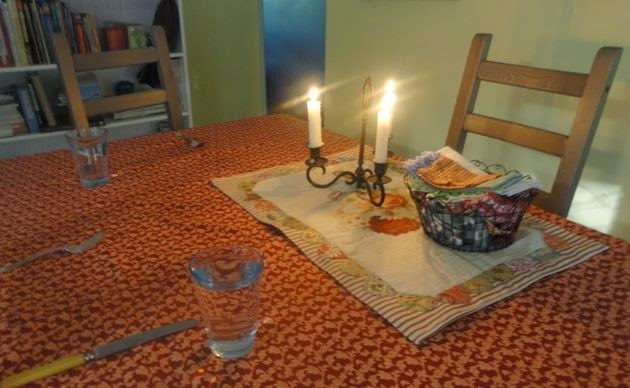 A time in our home when the already slow pace of life becomes more relaxed as we move away from the routines and expectations of the working week. 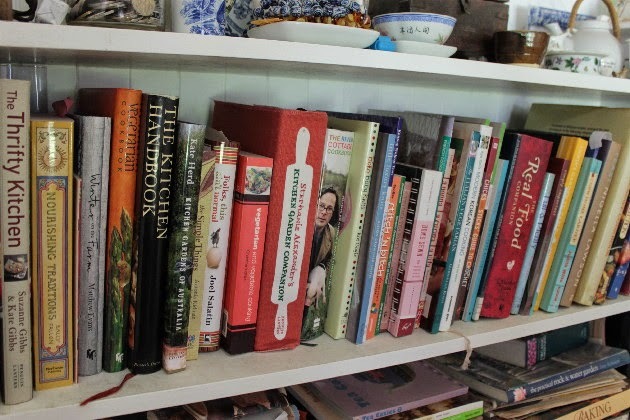 I'll be reading, knitting, gardening, cooking, baking and, no doubt, writing. I hope you enjoy whatever will occupy your weekend. Thank you for your visits this week. As always, it gives me reason to keep writing. 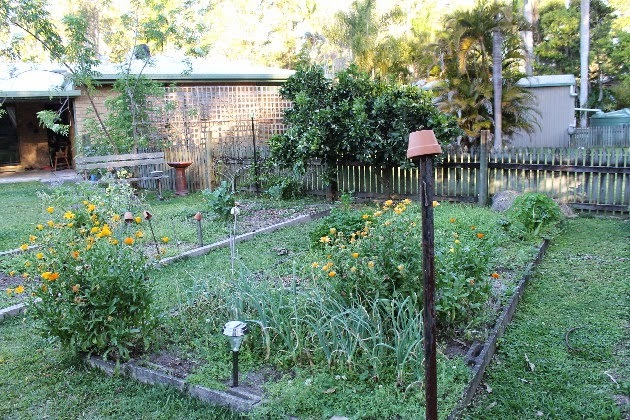 How much backyard do you need to feed a family of four? What's the most nutrient-rich vegetable? No, it's not kale, not by a long shot. Just a quick post today to remind all of those in the Brisbane and Sunshine Coast regions that the Real Food Festival is on in Maleny this weekend - 13 and 14 September at the Maleny Showground. The program, click here to read it, is full of interesting presenters but I think my picks would have been the sessions by Robyn Clayfield and Morag Gamble on Sunday morning. They're both local women with a huge amount of knowledge they share freely. But you can't go wrong with this festival. It's full of good local food, panel discussions, demonstrations and lively talks on a wide variety of food and food philosophies. 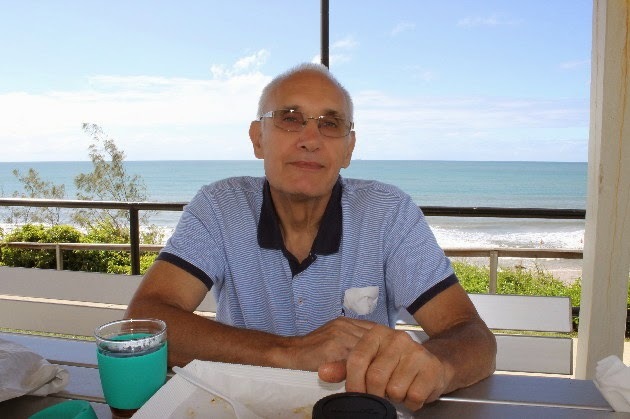 On Saturday, Costa Georgiadis will be presenting at the festival with Conondale and Montville school children who participate in the Stephanie Alexander Kitchen Garden Program. Call in and say hello to the folk at the Maleny Dairies stand too. They'll be there with their delicious milk and dairy foods. The Real Food Festival is certainly worth a visit this weekend. And congratulations to Julie Sheldon who organises the festival each year. By the look of the 2014 program, this year will be another stand out event. We had the last of the library talks yesterday with a fully booked group of about 70 people at the Redcliffe Library. Tina Cavanough, the Community and Reader Services Librarian, each of the head or acting head librarians and the volunteers at each library certainly made us both feel very welcome. We had coffee made for us and a delicious morning tea provided to all who came along. I'm delighted that every time we go out into the community for these get-togethers the numbers increase. I met a lot of the people who read this blog, thanks for coming over to say hello. It was a thrill to be able to meet you. We really did have a wonderful time. Today I'm back being a home body again. I want to have a full day to myself, doing what I want to do, before I start work on the book writing again. 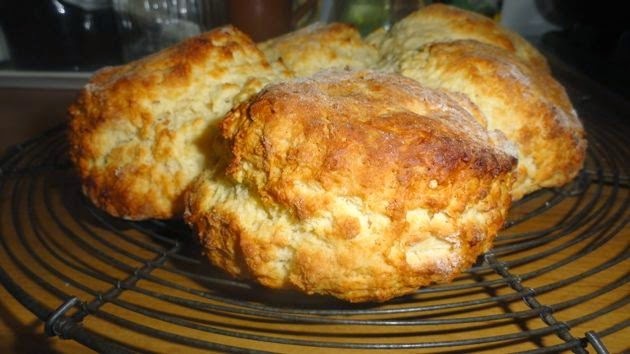 I have lavender, pepper, echinacea, watercress and lettuce seeds to plant, blueberry bushes to repot and prune, biscuits to make and some mending to do. I'm looking forward to it. I hope you too have some heart warming tasks to occupy yourself with today. If you're working outside the home, it won't be too long until the weekend. Hang in there. I was both surprised and delighted when a young woman I met at one of the libraries started talking about not going back to work after her second child was born. I was surprised because she told me that until she read my thoughts about it she'd never hear of any parent staying at home to raise children and to make the most of every frugal, domestic opportunity instead of returning to work. Her experience was that all couples work, before children and after children. She said all the couples she knows work, both her parents work and she thought that is just how it is meant to be. I was delighted to tell her that although it is a road less travelled, having one parent in paid work and the other looking after the children and the home, can be the pathway to a rewarding and significant life change. When I was a young girl, it was the norm in Australia, and many other Western countries, for the mother to leave paid work when her first baby was born. She stayed at home as a homemaker rather than return to paid work. That changed in the late 1960s and 1970s when credit cards were introduced and many families started buying goods on credit instead of saving for them first, then paying cash. 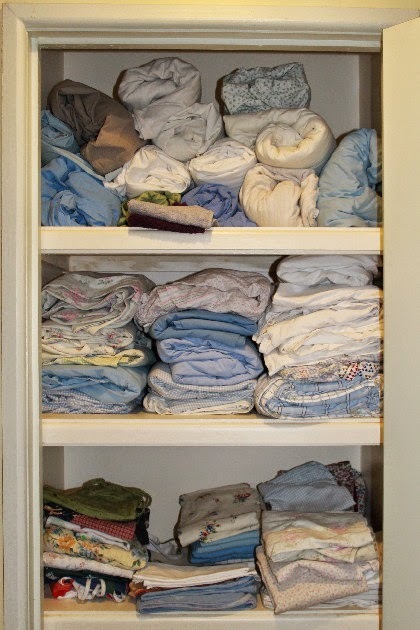 This increased the standard of living and during the 70s we all bought colour TVs and flash cars and instead of waiting for our clothes and shoes to wear out, we bought new ones, just because we could. Often we used credit cards or hire purchase. Soon it wasn't a choice to go back to work, many families had both parents work because it was the only way they could pay for what they wanted to buy. Over the years house prices rose and soon working to pay for our purchases became a way of life. It was then normal for both partners to work. Many see this as a gender issue, I don't. I think it's a financial one that stems from consumerism. It is so commonplace and accepted now that younger women and men think it's always been like this. I understand that many people find validation working at their paid job. Many love the social aspect of work. But it does not suit everyone. So I want to say this very clearly - we all need to work to pay for our own place to live - either by buying a home or renting one; we all need to furnish our homes, buy clothes, pay for transport and education. I get that, I've done it. But once that start is made, there is a lot of value in a couple splitting the work they do with one remaining in the workforce and one working at home and raising children while creating sustainable, domestic work practises. I have done many things in my life. I've raised a family, I have a degree, I've run my own business, I do understand the financial framework we all live within. But I have to tell you that domestic work is meaningful and fulfilling and until I came home and worked here to keep my home running smoothly, I'd never been this happy. I wish I'd done it sooner. I've lost count of the number of emails I've received from people over the years who have been encouraged to make this move towards the split work model - one in paid work and one in domestic work. I often get follow up emails with wonderful news about success, contentment and satisfaction - both for the paid worker and the domestic worker. Having someone at home seems to focus them on working as a team and their purpose is clear. They're not working because everyone does, they're working to build a life together. There is satisfaction and meaning for both of them because they're both playing an active role in family life and debt reduction. As I said before, I don't think this is a gender issue, it's a lifestyle choice. Some families go for the less traditional woman doing the paid work and the man at home; it works both ways. Gay couples often make that decision based on who wants to go out to work. But no matter who it is doing the domestic work, that person usually has a period of skill building. It's like any new job - there are routines to build, time is spent organising the home and there is an emphasis on home production and what is seen by some as the redundant skills of the homemaker to create this new way of working. It's a new kind of team - a two person team, living old values in new ways. And yes, I agree it's not for everyone but for those who try it, the rewards are usually abundant and consistent. Now we're moving towards the end of the year I've start thinking about my Christmas gifts. I want no last minute rush and I need to get the best value for the dollars I have to spend. I've cut down considerably on gift spending since I changed to a simpler way of life and now I look for bargains and make what I can. The trick here is to start now - both on making and buying because the closer we get to the holidays, the less time you'll have and the more prices will go up. I hope I can encourage you to make a list of the gifts you want to give, work to a budget that won't break the bank and can be completely paid for in cash, then slowly but surely start collecting your gifts as the weeks roll on. Remember, always work to your budget, don't let the excitement of the holidays push you into overspending and look for the best value for money. It's also a good idea to work out your Christmas and holiday menus so you can start looking around for anything you can buy now. 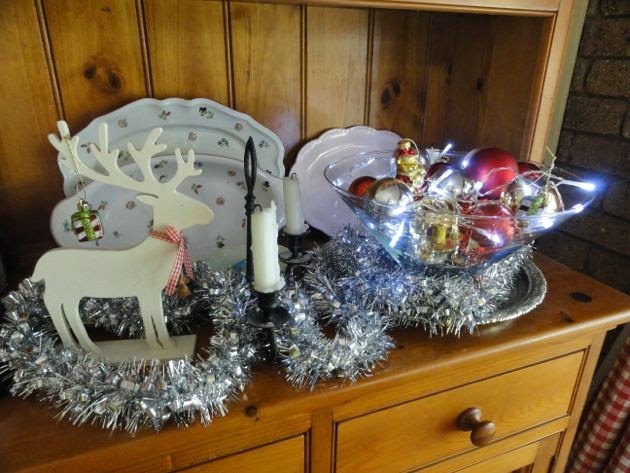 Packing these things away in the cupboard will help you plan later on and also free up your shopping bags when you have many other extras to bring home closer to Christmas. But that's something we can look at in a few weeks time. Let's get into the gifts first because organising yourself now will allow you to plan mindfully and increase your chances of sticking to your budget. I've started my gift knitting and sewing. 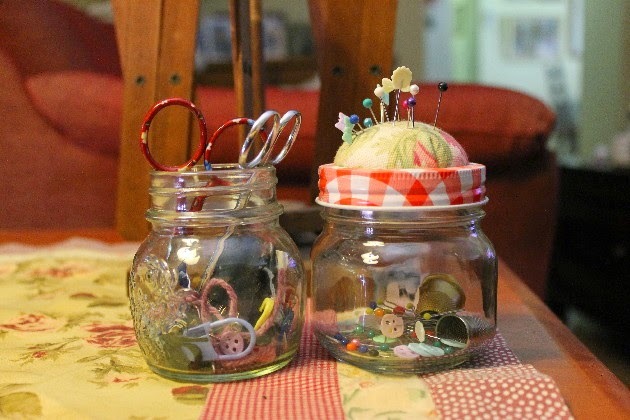 My homemade gifts include pin cushion jars for my sewing friends (above). I'm also making dish and face cloths with organic knitting cotton that I already have here. I've started making these and will continue knitting whenever I have free time. I also want to make more soap for gift giving, so I have to put the ingredients for that on my next shopping list and make it up soon so it will cure in time. I might do up a couple of cleaning hampers too - with laundry liquid, dishcloths, soap, citrus vinegar spray and homemade gumption. Again those ingredients need to be bought and I have to think about containers. 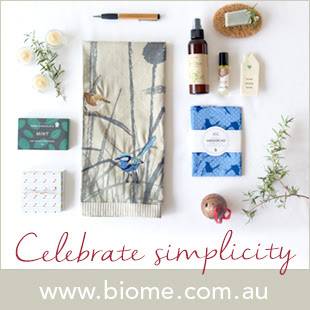 When I start looking at buying, I want to buy gifts that reflect my values so I shop at places like Biome, who are happily one of my sponsors. By coincidence, I put in an order yesterday and found they're having a 25 percent off almost everything starting tomorrow, so I knew I had to pass that on to you. Luckily, the sale is open to in-store customers and online. Over the years, I've had a few things posted out to me from Biome. 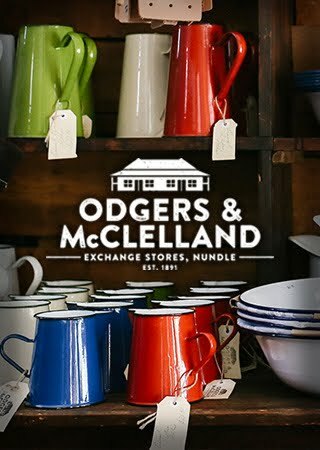 Their service is impeccable, they pack the products properly and they have a wide variety of good quality, environmentally sound gifts. 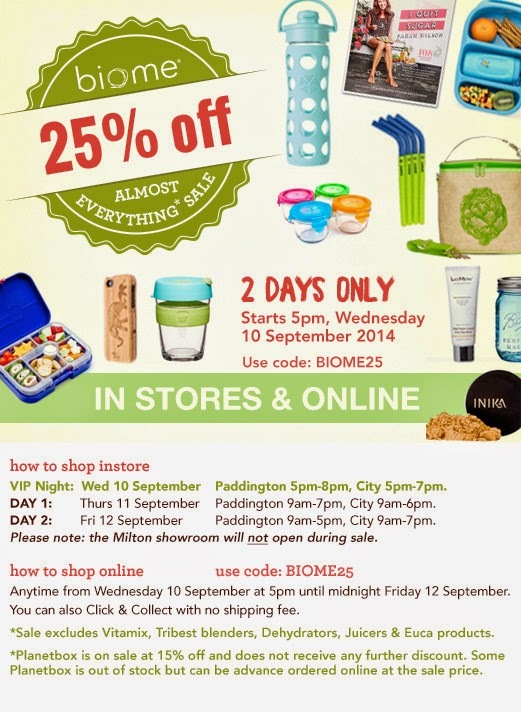 And for those reasons I'm happy to recommend them to you, but remember, their sale starts tomorrow and ends on Friday. Over at the Down to Earth Forum, the ladies have been Christmas planning and making lists since July. There is a very good thread about making your own gifts, cards and decorations to get you going and keep you motivated. Another thread, Countdown to Christmas, has a few links to interesting sites that may give you some ideas if you're not sure what to do. And there is a Christmas swap starting at the forum soon too. Click here to read the thread.